Double Feature - PHANTOM FROM 10,000 LEAGUES (1956) and THE BEAST WITH A MILLION EYES (1956). CLICK IMAGE FOR DETAILS. Midnight Movies Double Feature: THE BOY AND THE PIRATES (1960) and CRYSTALSTONE (1988). CLICK IMAGE FOR DETAILS. Midnight Movies Double Feature: CAPTAIN BLOOD (1960) and CAPTAIN PIRATE (1952). CLICK IMAGE FOR DETAILS. Midnight Movies Double Feature: CHOSEN SURVIVORS (1974) and THE EARTH DIES SCREAMING (1965). CLICK IMAGE FOR DETAILS. Stars Robert Quarry, Robert Perry, Michael Murphey and Donna Anderson. A group of young people get involved with an occult expert, Count Yorga. CLICK IMAGE FOR DETAILS. Outside of a European castle a strange spacecraft lands. A being with a large, weird head tries to commnicate with Robert Clarke and others in the castle. Is he friendly or malevolent? CLICK IMAGE FOR DETAILS. Midnite Movies Double Feature: THE MONSTER THAT CHALLENGED THE WORLD (1957)/IT! THE TERROR FROM BEYOND SPACE (1958). CLICK IMAGE FOR DETAILS. 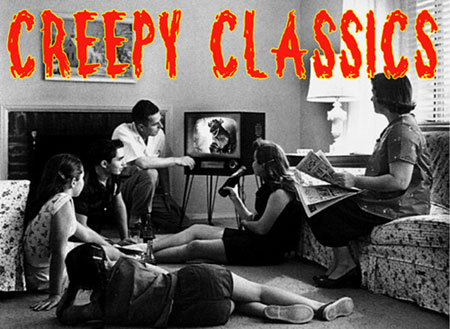 Midnite Movies: THE OBLONG BOX (1969)/SCREAM AND SCREAM AGAIN (1969) - Double Feature. CLICK IMAGE FOR DETAILS. Midnite Movies: THE RETURN OF DRACULA (1958)/THE VAMPIRE (1957) - DVD. CLICK IMAGE FOR DETAILS. Stars Paul LeMat, Nancy Allen, Kenneth Tobey and June Lockhart. A throw-back to the 1950's alien invasion films with 50s veterans: Kenneth Tobey (THE THING, IT CONQUERED THE WORLD) and June Lockhart. CLICK IMAGE FOR DETAILS.